Do you ever go on vacation and the water feels...different? Others may think you're going crazy, but water quality does differ depending on where you live and where your water is coming from. What makes water hard is minerals such as calcium and magnesium. These dissolved solids can cause buildup on dishes, pipes and even your own body. No one likes the look of soap scum or clogged, corrosive plumbing, but you can most definitely soften your water. One would think having minerals in water would be helpful, but hard water can cause many problems. If you have hard water in your household, you can install a water softener. Water softeners remove minerals like calcium and magnesium ions and replace them with salt/sodium. You don't just want to buy any old water softener though—you're going to need an NSF-certified water softener. It's essential that the system monitors when salt is low. If the salt is low, this will cause the water to become hard again. All you really have to do is figure out what type of softener you want to purchase. You have the options of buying an automatic, semi-automatic or manual water softener. Water softeners collect the hardness minerals in a tank and flush them away to drain. But if you want to convert your water, you're going to need one with an ion exchanger. Ion exchangers will replace calcium and magnesium ion with sodium or potassium. If you purchase a good water softener, it will last for years. All you have to do is occasional upkeep maintenance, and sometimes fill the softener with salt. There are three types of salt sold for water softening: rock salt, solar salt and evaporated salt. Rock salt forms naturally in the ground and is mined through traditional mining methods. Rock salt has between 98and 99 percent sodium chloride. Solar salt is typically obtained through the evaporation of seawater and contains 85 percent sodium chloride. Solar salt can be purchased in a crystal form or pellets. Lastly, evaporated salt is mined through underground salt deposits of dissolving salt. The moisture is evaporated by using energy from natural gas or coal. This contains between 99.6 and 99.99 percent sodium chloride. 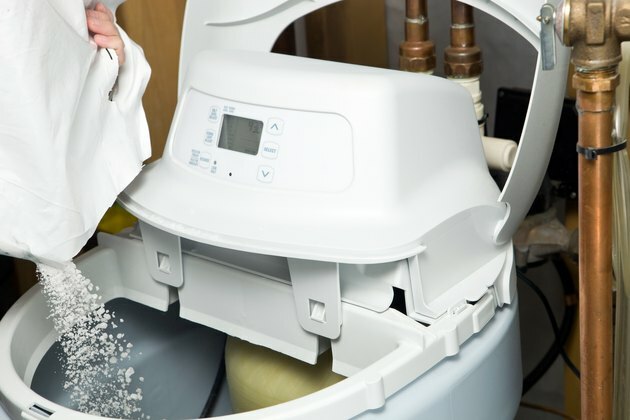 Although salt-based water softeners are the go-to, there's also salt-free water softeners. People prefer salt-based water softeners because your skin will feel softener, your clothes brighter and there won't be build up in your showers. Salt-free systems will reduce buildup, but it softens the skin without adding sodium to the water. Ultimately it is more environmentally friendly, and good for people who suffer from heart disease and high blood pressure. The real difference is that if you have super hard water, then salt-based systems do an amazing job at removing hardness.